Looking for a place to grab a drink before or after hitting up a club in Roppongi? 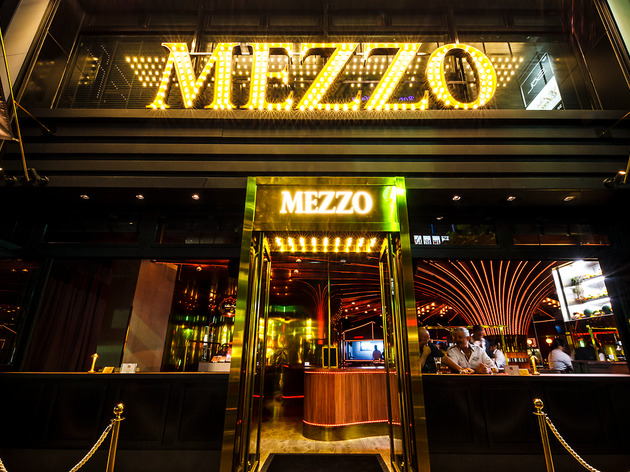 Head straight for Mezzo, the neighbourhood’s latest flashy addition on Gaien Higashi-dori. Opened on July 29, their aim is to be the answer to the question ‘so where shall we go next?’ That may be a tall order in an area filled with restaurants, bars and clubs, but with their combination of feisty drinks and an easy-to-drop-in atmosphere, stopping by for a tipple or two after dinner (or when you’ve exhausted your dancing skills early at a nearby club) isn’t exactly a hard choice. 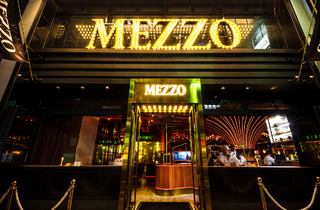 Here are five things that make Mezzo stand out from the rest of the Roppongi pack. You can almost pretend you’re being healthy by drinking: the fruit cocktails at Mezzo are made from a whole batch of very fresh, seasonal fruit – and topped off with a chunk of it for good measure. Definitely Instagram-worthy, and considering the entire venue is non-smoking (a rarity – Ploomtech vaping is OK though), you’ll actually be able to enjoy the delicate, balanced-out sweetness of your drink. Mezzo may not have a terrace in the classic sense, but their windowside seats pretty much capture the idea of an open-air perch. Through the metres-high windows, which are opened during summer, you’ll be able to admire and contemplate the main Roppongi drag. It’s the perfect opportunity for people-watching – and to be seen, of course. Unlike most bars in the area, Mezzo has both local and international DJ spinning tunes Monday through Saturday, with LED lights flashing all around to boot. The DJ is perched in a makeshift recording studio booth – more Insta-fabulous than functioning – while the ceiling is covered in pretty lights which change colour intermittently. Secret: Mezzo doesn’t have just one, but two floors. Upstairs is a reservations-only VIP area, where nabbing a table will require at least a ¥5,000 table charge and one bottle order (from ¥13,000). To keep with the exclusive vibe, you’ll need to supply a pin code when making a reservation; once you arrive, staff will ask for the code and only then will the door to this coveted hideout open. Swanky indeed. If you haven’t made a booking, you’ll have to wait for a table to free up – ask the staff for options. Stuck on where to go next? Just ask Mezzo’s staff: they’re perfectly adept at giving recommendations for any club or bar in the area based on your preferences, and can arrange VIP table reservations and/or access to some clubs too. Is your Japanese is a bit shaky? Don’t worry – staff are conversant in English.